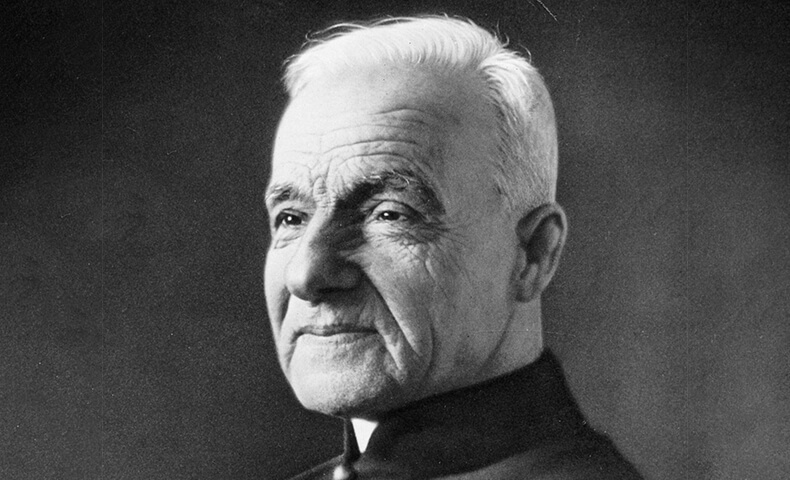 Brother André expressed a saint’s faith by a lifelong devotion to Saint Joseph. Sickness and weakness dogged André from birth. He was the eighth of 12 children born to a French Canadian couple near Montreal. Adopted at 12, when both parents had died, he became a farmhand. Various trades followed: shoemaker, baker, blacksmith—all failures. He was a factory worker in the United States during the boom times of the Civil War. At 25, André applied for entrance into the Congregation of Holy Cross. After a year’s novitiate, he was not admitted because of his weak health. But with an extension and the urging of Bishop Bourget, he was finally received. He was given the humble job of doorkeeper at Notre Dame College in Montreal, with additional duties as sacristan, laundry worker and messenger. “When I joined this community, the superiors showed me the door, and I remained 40 years,” he said. When he heard someone was ill, he visited to bring cheer and to pray with the sick person. He would rub the sick person lightly with oil taken from a lamp burning in the college chapel. Word of healing powers began to spread. When an epidemic broke out at a nearby college, André volunteered to nurse. Not one person died. The trickle of sick people to his door became a flood. His superiors were uneasy; diocesan authorities were suspicious; doctors called him a quack. “I do not cure,” he said again and again. “Saint Joseph cures.” In the end he needed four secretaries to handle the 80,000 letters he received each year. For many years the Holy Cross authorities had tried to buy land on Mount Royal. Brother André and others climbed the steep hill and planted medals of Saint Joseph. Suddenly, the owners yielded. André collected $200 to build a small chapel and began receiving visitors there—smiling through long hours of listening, applying Saint Joseph’s oil. Some were cured, some not. The pile of crutches, canes and braces grew. The chapel also grew. By 1931, there were gleaming walls, but money ran out. “Put a statue of Saint Joseph in the middle. If he wants a roof over his head, he’ll get it.” The magnificent Oratory on Mount Royal took 50 years to build. The sickly boy who could not hold a job died at 92.